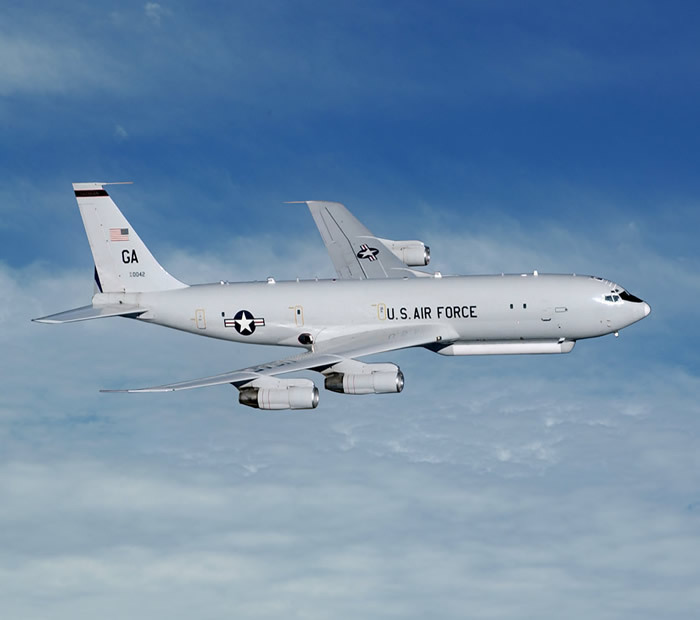 The E-8C Joint Surveillance Target Attack Radar System (Joint STARS) is an airborne battle management, command and control, intelligence, surveillance and reconnaissance platform. Its primary mission is to provide theater ground and air commanders with ground surveillance to support attack operations and targeting that contributes to the delay, disruption and destruction of enemy forces. 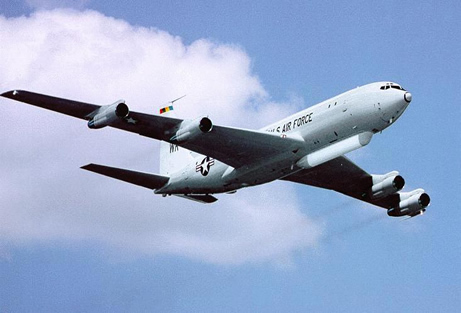 The E-8C is a modified Boeing 707-300 series commercial airframe extensively remanufactured and modified with the radar, communications, operations and control subsystems required to perform its operational mission. The most prominent external feature is the 40-foot (12 meters) long, canoe-shaped radome under the forward fuselage that houses the 24-foot (7.3 meters) long, side-looking phased array antenna. The radar and computer subsystems on the E-8C can gather and display detailed battlefield information on ground forces. The information is relayed in near-real time to the Armyxs common ground stations and to other ground command, control, communications, computers and intelligence (C4I) nodes. The antenna can be tilted to either side of the aircraft where it can develop a 120-degree field of view covering nearly 19,305 square miles (50,000 square kilometers) and is capable of detecting targets at more than 250 kilometers (more than 820,000 feet). The radar also has some limited capability to detect helicopters, rotating antennas and low, slow-moving fixed wing aircraft. 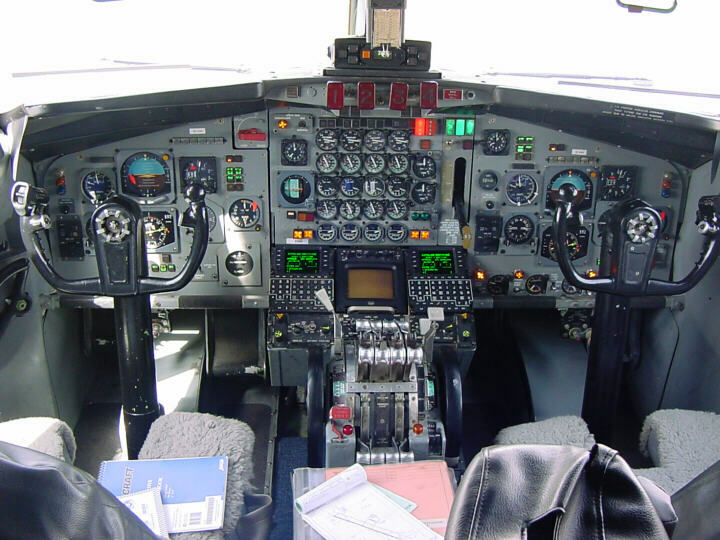 As a battle management and command and control asset, the E-8C can support the full spectrum of roles and missions from peacekeeping operations to major theater war. Joint STARS evolved from Army and Air Force programs to develop, detect, locate and attack enemy armor at ranges beyond the forward area of troops. The first two developmental aircraft deployed in 1991 to Operation Desert Storm and also supported Operation Joint Endeavor in December 1995. Joint STARS supported NATO troops over Bosnia-Herzegovina in 1996, Operation Allied Force from February to June 1999, and Operation Enduring Freedom and Operation Iraqi Freedom in 2003. The 116th Air Control Wing is America's first "Total Force" wing. The former 93rd Air Control Wing, an active-duty Air Combat Command unit, and 116th Bomb Wing, a Georgia Air National Guard unit, were deactivated Oct.1, 2002. The 116th Air Control Wing was activated blending Guard and active-duty airmen into a single unit. 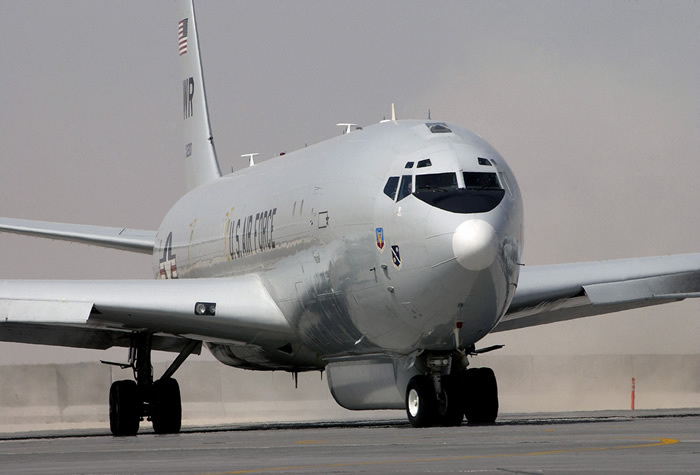 The 116th ACW is the only unit that operates the E-8C and the Joint STARS mission. There are 15 aircraft in the inventory with two more scheduled to arrive by early 2005. Primary Contractor: Northrop Grumman Corp.